Clink was a state-of-the-art robot with the dazzling ability to make toast and play music at the same time. But that was many years ago. Now kids want snazzier robots who do things like play baseball and bake cookies. 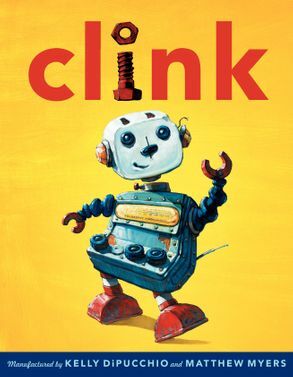 So day after day, Clink sits on a shelf and sadly watches as his friends leave with their new owners. He almost gives up on ever finding a home-until the day Clink spies a boy who just might be able to be the right one for him. . . .
From #1 New York Times bestselling author Kelly DiPucchio and new talent Matthew Myers comes a funny and heartwarming story that lovers of Corduroy will adore. Kelly DiPucchio is the author of numerous children's books, including the New York Times bestselling Grace for President. She also wrote Dinosnores, What's the Magic Word, and Bed Hogs. Kelly lives in southeastern Michigan with her husband and three children.